Temperament is a configuration of observable personality traits, such as habits of communication, patterns of action, and sets of characteristic attitudes, values, and talents. It also encompasses personal needs, the kinds of contributions that individuals make in the workplace, and the roles they play in society. Each temperament has its own unique qualities and shortcomings, strengths and challenges. Dr. David Keirsey has identified humankind's four basic temperaments as the Artisan, the Guardian, the Idealist, and the Rational. What accounts for the differences we see in the four temperaments? To use the idea of temperament most effectively, it is important to understand that the four temperaments are not simply arbitrary collections of characteristics, but spring from an interaction of the two basic dimensions of human behavior: our communication and our action, our words and our deeds, or, simply, what we say and what we do. First, people naturally think and talk about what they are interested in, and if you listen carefully to people's conversations, you find two broad but distinct areas of subject matter. At times, of course, everyone addresses both sorts of topics, but in their daily lives, and for the most part, Concrete people talk about reality, while Abstract people talk about ideas. Some people talk primarily about the external, concrete world of everyday reality: facts and figures, work and play, home and family, news, sports and weather – all the who-what-when-where-and how much's of life. Artisans and Guardians are concrete in their communication. Other people talk primarily about the internal, abstract world of ideas: theories and conjectures, dreams and philosophies, beliefs and fantasies –all the why's, if's, and what-might-be's of life. Idealists and Rationals are abstract in their communication. Second, at every turn people are trying to accomplish their goals, and if you watch closely how people go about their business, you see that there are two fundamentally opposite types of action. Other people act primarily in a cooperative or socially acceptable manner, that is, they try to do the right thing, in keeping with agreed upon social rules, conventions, and codes of conduct, and only later do they concern themselves with the effectiveness of their actions. Guardians and Idealists are cooperative in their action. Some people act primarily in a utilitarian or pragmatic manner, that is, they do what gets results, what achieves their objectives as effectively or efficiently as possible, and only afterwards do they check to see if they are observing the rules or going through proper channels. Artisans and Rationals are utilitarian in their action. Keirsey also observed that people have different core pursuits based on their temperament. Each of the four temperaments take different paths to self-esteem. In other words, based on a person's temperament, they will be driven differently, and will feel best about themselves when they are a certain way, and are acheiving aims which matter to them. Keirsey also observed that we are naturally intelligent in different ways. In a sense every individual has not one but four IQs, and it is virtually impossible for one person to develop all four of his or her capabilities equally. The kind of operation practiced most develops most, while that practiced least develops least. Naturally, we all have our short suit as well as our long suit in the things we do well. Whatever our long suit, we are not totally without talent in our short suit—it is merely shorter. Keirsey's four temperaments can be further subdivided, often referred to as "Character Types" or "Personality Types." 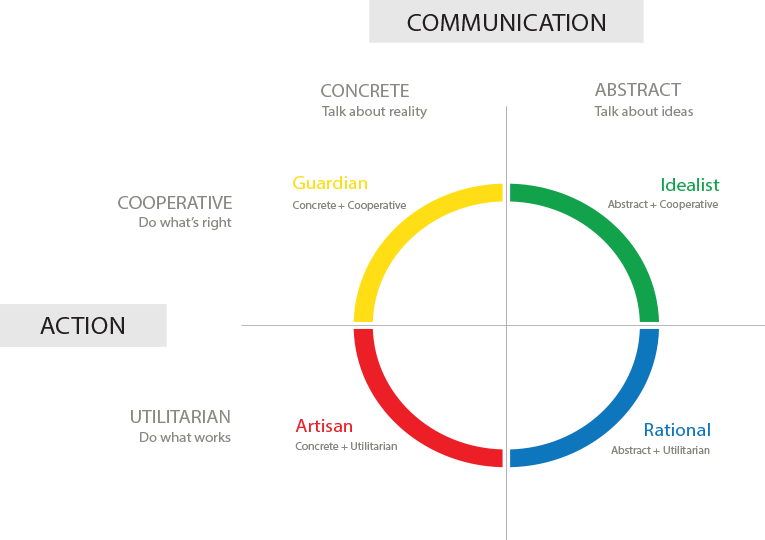 There are four types of Artisans, four types of Guardians, four types of Rationals, and four types of Idealists, which make up for 16 types in total.